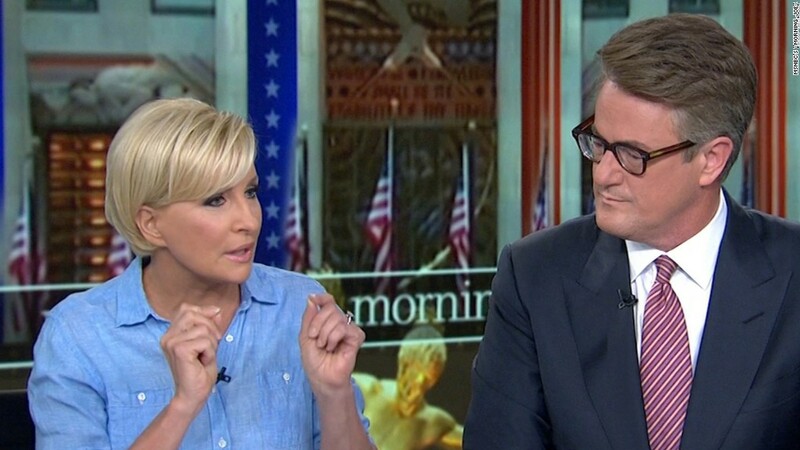 MSNBC hosts Joe Scarborough and Mika Brzezinski say President Trump and his White House used the possibility of a hit piece in the National Enquirer to threaten them and change their news coverage. President Trump has a very different account of what happened. "FAKE NEWS," he tweeted during "Morning Joe" Friday morning. But Scarborough says he has proof of White House threats earlier this year -- he replied to Trump and said "I have texts from your top aides and phone records." And an NBC News spokesman told CNN that Scarborough kept several executives apprised of the alleged threats "contemporaneously." This may bolster Scarborough's stunning claim. Scarborough and Brzezinski are essentially alleging a form of blackmail. The accusation came during a wider discussion about the president's offensive tweets targeting the co-hosts. But a White House official suggested to CNN that nothing untoward had occurred. The official told CNN that Scarborough called Trump's son-in-law, Jared Kushner, about the Enquirer story before it was published. Kushner, the official said, told Scarborough to call the president. The official denied there was ever any offer from Kushner of a quid pro quo -- in other words softer coverage in exchange for spiking the Enquirer story. The White House has yet to comment publicly. Critics suggested that if Scarborough and Brzezinski's version of events is accurate, it should be investigated. "The president's tacit admission of control over the Enquirer's punishing coverage of his adversaries suggests an abuse of power -- a shocking one," said Norm Eisen, a former White House ethics czar. Eisen is currently involved in a lawsuit against Trump. What's definitely true is this: Trump and the publisher of the National Enquirer, David Pecker, are friends and allies. Jeffrey Toobin documented the mutually beneficial relationship in this week's edition of The New Yorker. The Enquirer, a supermarket tabloid, frequently promotes the president's agenda. And the Enquirer did publish a negative story about Scarborough and Brzezinski back in early June. On Friday, the editor in charge of the Enquirer, Dylan Howard, said "we have no knowledge of any discussions between the White House and Joe and Mika about our story, and absolutely no involvement in those discussions." Here's exactly what the co-hosts alleged on Friday's "Morning Joe." Scarborough didn't name names, but he said "three people at the very top of the administration" called him about this. "The calls kept coming and kept coming, and they were like 'Call. You need to call. Please call. Come on, Joe. Just pick up the phone and call him.'" In other words, grovel to the president and he'll make the mean story disappear. Scarborough did not immediately respond to a request from CNN for more details. But he and Brzezinski also described the alleged discussion in a Washington Post column on Friday. "This year," they wrote, "top White House staff members warned that the National Enquirer was planning to publish a negative article about us unless we begged the president to have the story spiked. We ignored their desperate pleas." Scarborough and Brzezinski are now engaged. The negative article was about their past marriages and the beginning of their relationship. It was published in early June. Dylan Howard, the chief content officer for the Enquirer's parent company American Media, said "we accurately reported" the story, but "at no time did we threaten either Joe or Mika or their children in connection with our reporting on the story." "Let me explain what they were threatening," she said. "They were calling my children. They were calling close friends." She said "these calls persisted for quite some time, and then Joe had the conversations that he had with the White House where they said 'Oh, this could go away.'" In response, White House press secretary Sean Spicer told reporters that he is "not aware" of White House officials pressing Scarborough to call up Trump and make nice. The president himself weighed in via Twitter a few minutes later. He said he heard what Scarborough said on "Morning Joe," but claimed that it's untrue: "He called me to stop a National Enquirer article. I said no! Bad show." Scarborough responded quickly to Trump's tweet with one of his own, writing, "Yet another lie. I have texts from your top aides and phone records. Also, those records show I haven't spoken with you in many months." -- CNN's Jim Acosta contributed reporting.